#NACAC17 is quickly approaching! It will be my second time attending the conference of all conferences and I will be much better prepared this time than last. Here are a couple of things you should know to be a step ahead of the game. 1. Pack appropriately! You will be in sessions during the day, attending socials in the evening, and exploring Boston in your spare time before or after the conference. Maybe you are looking forward to getting in a few runs or walks for exercise too. Whatever you do, don’t UNDER-pack. You also don’t want to pack like this guy though. 2. #NACAC17 is expecting approximately 8,000 members of the college admission counseling community. You certainly don’t need to bring 8,000 business cards, but bring a good amount. You never know who you will meet! 3. Aside from the conference sessions, there are a few “mini” sessions that take place in the Exhibit Hall! Keep an eye out for “Learning Lounges,” “Exhibitor Presentations,” and “Tech Labs,” which cover myriad resources and topics. 4. You can’t be in multiple places at once and you don’t need to! Think about getting a conference audio package so that you can have access to concurrent sessions you weren’t able to attend. 5. Don’t miss the First-Timers’ Orientation on Thursday morning. You’re not the only one at the conference for the first time, so why not bond with those sharing the experience with you? You’ll also learn more about the ins and outs of the conference from NACAC leaders. Coming to #NACAC17?! Don’t hesitate to add me on Twitter (@WPCarlosC). See you in Boston! 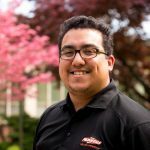 NACAC member Carlos Cano is assistant director of admissions recruitment for William Paterson University (NJ). He is president-elect of the New Jersey Association of College Admission Counseling. Love this! See you soon Carlos! Thanks Meghan! See you soon!